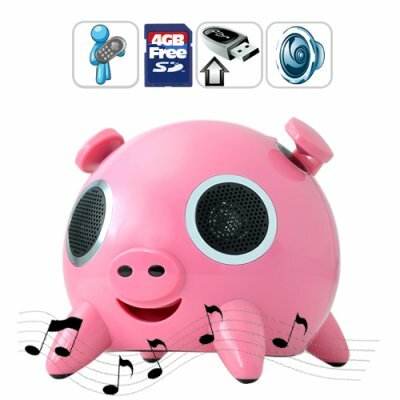 Successfully Added Piggy Desktop Stereo Speaker - (SD Card, USB, MP3 Player) to your Shopping Cart. No, your eyes aren’t deceiving you. Presenting this desktop piggy stereo speaker with SD card, USB and a 3.5mm audio input for playing your favorite MP3's. This cute little piggy sports a 15 watt subwoofer and 4 speakers emitting 8 watts of crystal clear audio... And it comes with a free 4GB SD Card! This attractive gadget is built with touch buttons, meaning, all it takes is a slight touch and you can change music tracks and adjust the volume. Alternatively, if you're away from your desk or just don’t feel like getting up, you can then easily operate this piggy stereo speaker using the included remote control for the added convenience. If you’re looking for something a bit different from the usual black or silver speakers, then you've come to the right place! This desktop piggy speaker is designed to work with PCs, MP3 players, laptops, or indeed any other multimedia device, and at the risk of sounding like big sissies, it's off the scale cuteness wise. The Piggy Stereo Speaker with Bass Control can easily be connected to your stereo / music source via the headphone socket using the 3.5mm audio lead provided. Show your friends and family just how much you care, as this special piggy stereo speaker comes with remote control and makes the perfect gift for your friends or as a decoration on your desk. In stock now, at Chinavasion, click "Add to Cart", and we'll express ship you a piggy desktop speaker right away. As always, Chinavasion brings you the coolest China electronics gadgets at wholesale price! Does this touch volume stereo speaker come in any other colors?